January 27, 2019 By Todd Burgreen & filed under All Articles, Handguns, Weapons. Recent events illustrate what a dangerous world we inhabit, with terrorist attacks increasing in frequency. If a hostile situation is encountered, a citizen will most likely be defending themselves with a handgun, which is a compromise between portability and performance. Successful handgun designs constantly evolve. This is for a variety of reasons stemming mainly from market and technological impulses/pressures magnified by the ever-changing mission requirements of end users. The push to make a handgun more effective has been driving red-dot sights, higher-capacity magazines, and threaded barrels for mounting suppressors, compensators, etc. 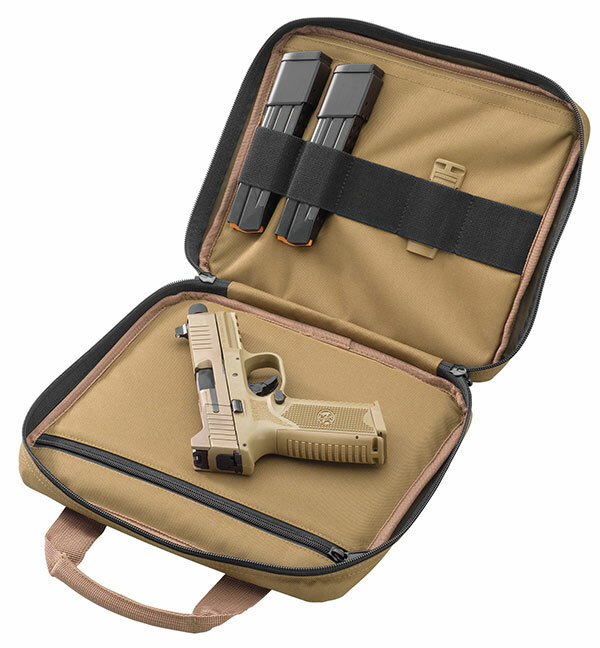 The FN 509 Tactical is the poster child of this design evolution, tracing its heritage in the FN family tree through the original FN 509 back to the FNS that was introduced in 2012. The striker-fired FNS was a departure from other FN handguns such as the FNX and FNP series, which are hammer-fired designs. 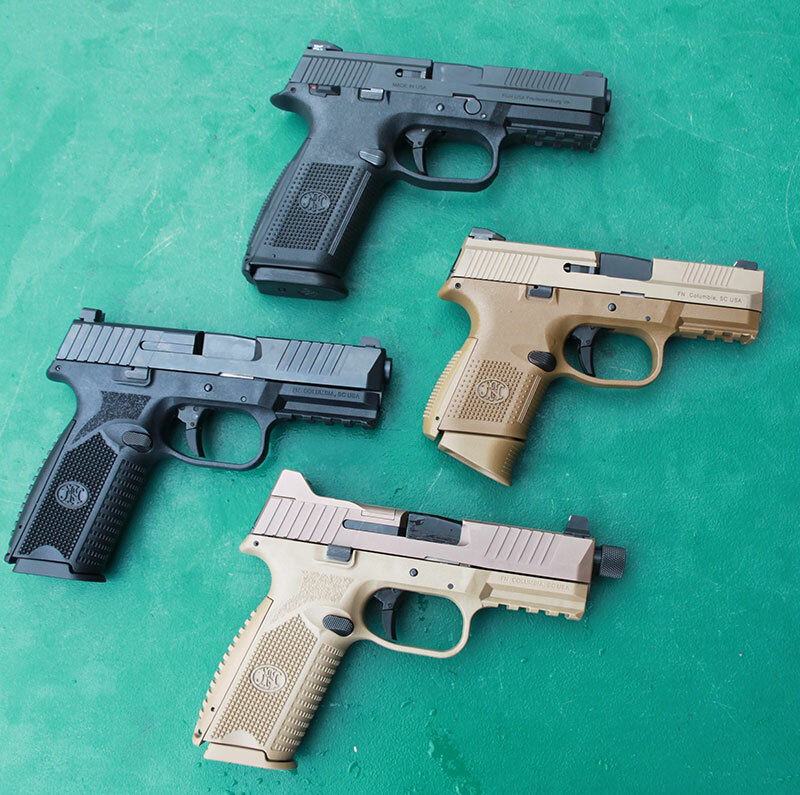 FN 509 Tactical (bottom) evolved from previous FN pistol designs such as FNS and FN 509. 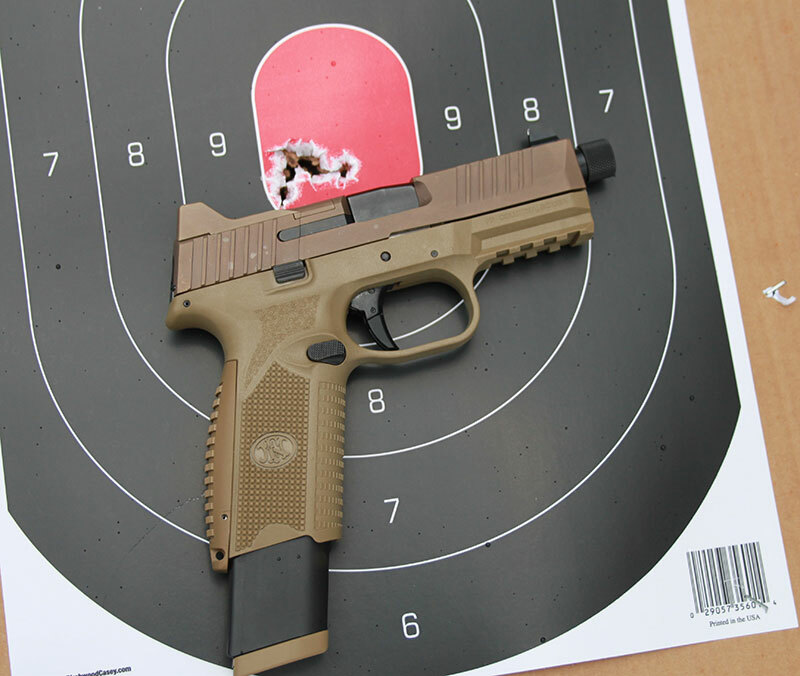 The FN 509 Tactical spawned from FN’s experience with the recent U.S. Army handgun trials. Now private citizens get to benefit from FN’s experience with the solicitation. Polymer-framed striker-fired handguns are inherently lighter, thinner, and simpler due to the limited number of parts needed to make the gun. Fewer large steel parts are needed, thus there are fewer parts to break or maintain. The relatively quick adoption of striker-fired weapons for law enforcement use bears out this truth. The striker-fired weapon works without a standard hammer or firing pin that we see in the first modern semiautomatic pistols. Instead, the firing pin, or “striker,” sits captive under some spring tension inside the slide. FN Low Profile Optics Mounting System (LPOMS) arrives with well-done directions on how to configure the slide properly for a variety of red dots. One basic concept that has remained constant, or stagnant depending on your point of view, is handgun sights. The earliest muzzle-loading pistols feature sights we can recognize today. Modern open sights are more refined, but the basic form is the same—align front post with rear notch. This is now undergoing a change with the increasing popularity of installing red-dot sights (RDS) in lieu of the traditional iron open sights for everyday personal-defense weapons, law enforcement, and military weapons. 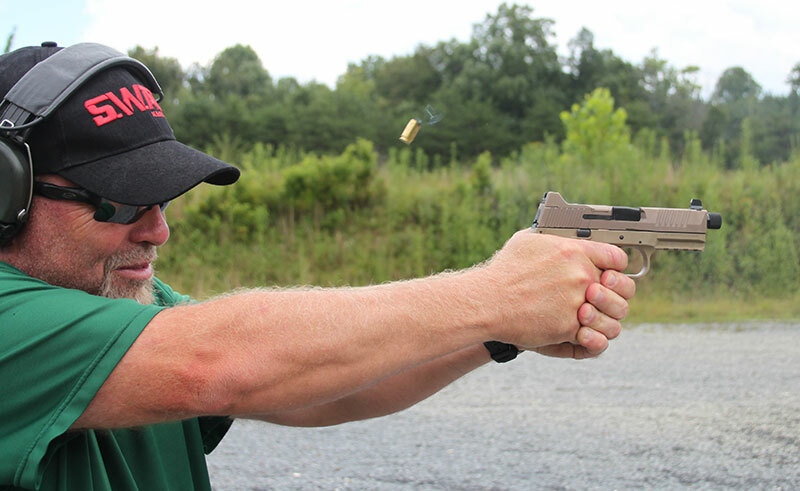 The RDS concept seeks to answer how best to enhance the handgun. The solution arrived at was the same as most had already opted for with their rifles—add a red-dot sight. 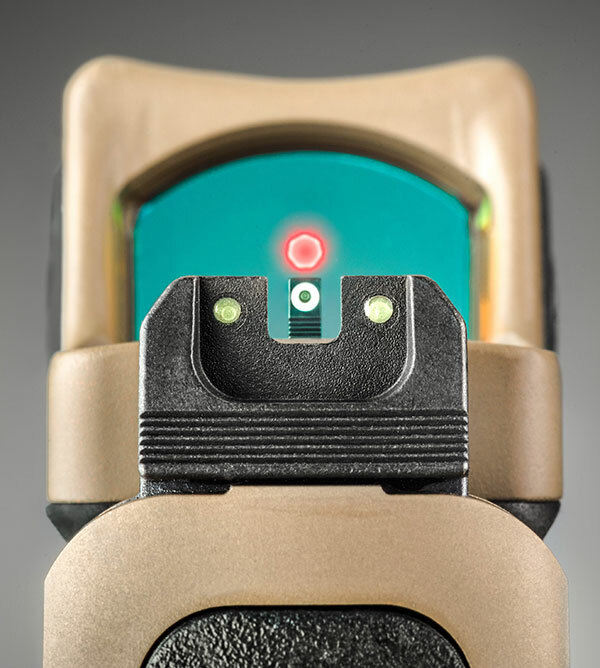 Orientation of suppressor-style iron sights around the red dot both acts as back-up sights and quickly fixes the shooter’s eye to the red dot stationed above the front post. The FN 509 Tactical package has many tweaks beyond the standard FN 509, including two extended-capacity 24-round magazines along with one 17 rounder, suppressor-height night sights, extended extractor, and threaded barrel. But the FN 509 Tactical features do not stop there. What really gets your attention is the rear sight assembly. That’s right, the FN 509 Tactical has the rear of the slide modified to facilitate mounting several of the most popular red-dot sights. FN labels this as their FN Low Profile Optics Mounting System (LPOMS), which features a series of plates for accommodating at least ten different red-dot optics. The FN LPOMS is being heralded as one of the best multi-red-dot mounting systems currently on the market. A blank plate covers the rear receiver when no red dot is being used. The plate mates seamlessly to the slide and provides protective “wings” to the elevated rear suppressor sight. An extensive packet of plates, screws, and spacers, along with a well-done instruction manual, is included with the FN 509 Tactical. 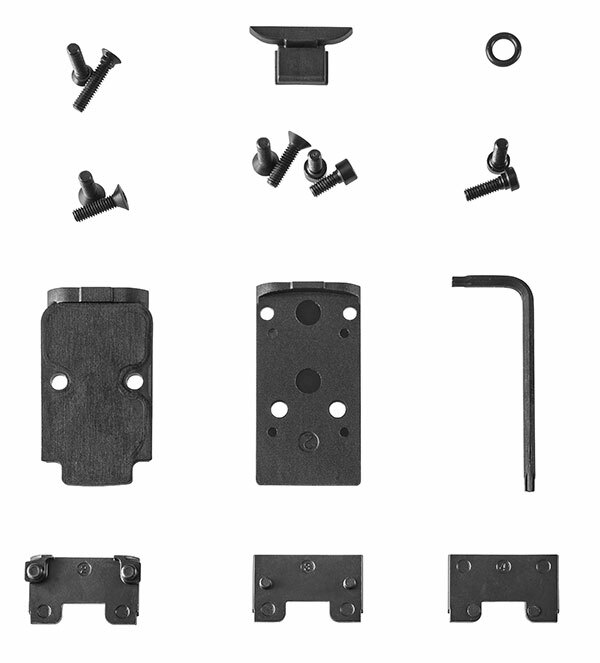 A quick reference indicates which combination of parts to use to mount a variety of red dots, all while maintaining reference to iron sights and the pistol’s bore. Besides having a slide milled to a specific red dot, the FN system is the best alternative method. 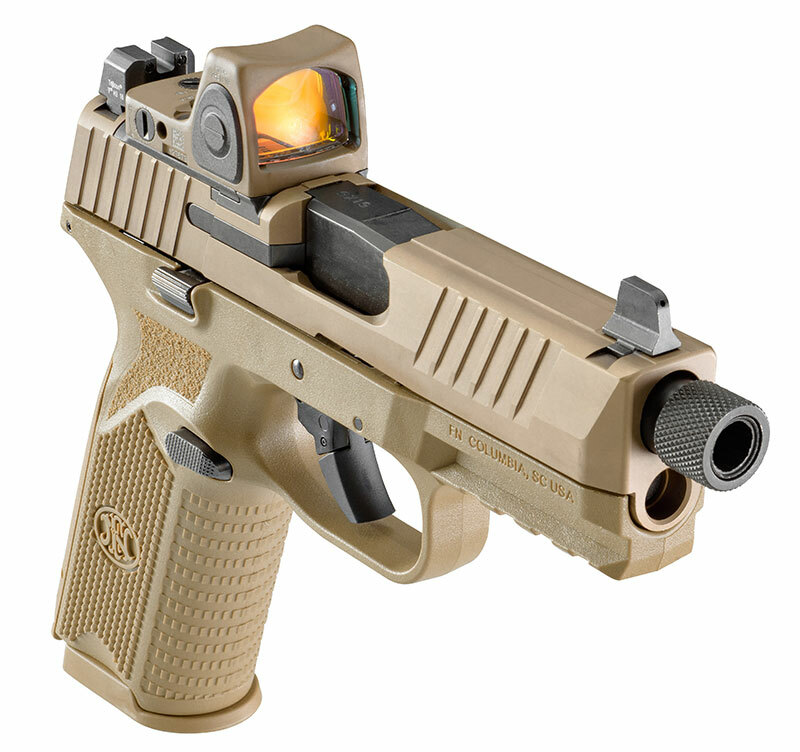 The FN 509 Tactical chambered in 9mm is the initial offering from FN. Flat Dark Earth is the only color offered at this time. The overall length of the 509 Tactical is 7.9 inches, with a 4.25-inch 1/2”x28 threaded barrel. The barrel is cold-hammer-forged stainless steel, with a 1:10 right-hand twist with polished chamber and feed ramp. The barrel features a recessed target crown. The slide is equipped with front and rear cocking serrations, with the external extractor visible. The external extractor also serves as a loaded chamber indicator. Ambidextrous slide lock levers and magazine release buttons are standard. The 509 Tactical weighs 27.9 ounces empty. The frame has a MIL-STD 1913 accessory rail. The FN 509 Tactical disassembles quickly via locking the slide open and rotating the takedown lever downward on the frame, freeing the slide from the frame. No tool marks are evident, nor lateral play in the slide’s fit to the frame or barrel to slide. The barrel locks up tight when in battery. The 509 Tactical operates via Browning’s locked-breech short-recoil method, slightly modified by moving the locking recess from the barrel to a single locking lug milled above the barrel’s chamber. FN barrels feature a notched groove in front of the chamber that serves as a further enhancement with this. The front contour of the barrel lug cam slot has been cut square to direct counter-recoiling forces up and forward into the barrel itself to reduce stress on the lug. Muzzle flip with FN 509 Tactical was minimal. The 509 Tactical’s slide mass and shape are engineered to aid in increased muzzle control for double taps or longer strings of fire. A low bore axis relative to the shooter’s hand allows for a very stable sight picture no matter how many or how rapidly rounds are fired. Mounting a red dot and suppressor to the 509 Tactical’s threaded barrel was an obvious decision. An adjustable LED 6.5 MOA dot Trijicon RMR was chosen, along with a Yankee Hill Machine Cobra M2 suppressor. 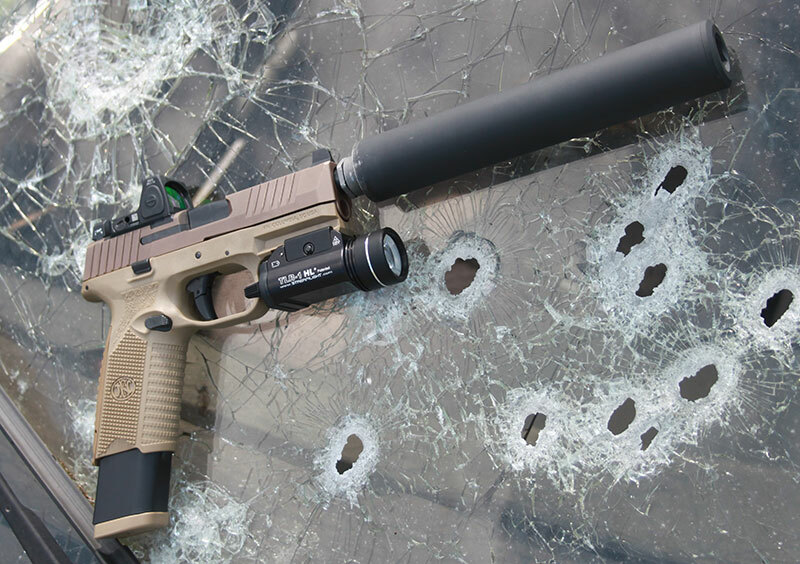 FN 509 Tactical fully kitted out with Trijicon RMR, YHM suppressor, and tactical light. 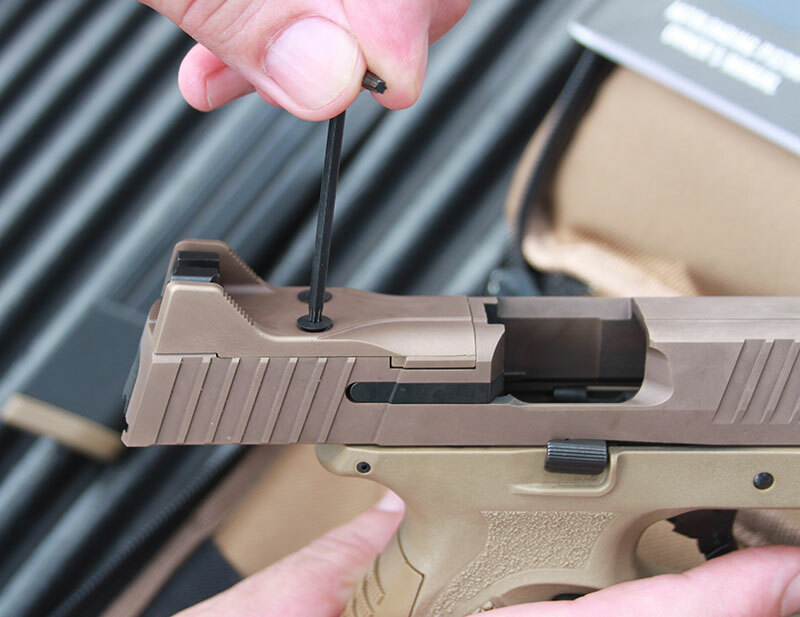 YHM’s Nielsen system lets the suppressor be adapted to any semiautomatic handgun for flawless functioning by simply purchasing the correct adapter. The Cobra M2 utilizes stainless steel components to minimize wear of the threads and the Nielsen device. Cobra M2 sound suppressors are constructed using Sound Tech’s patented baffle design. It does not take a drastic leap to visualize what roles the FN 509 Tactical would fill when equipped with suppressor and red dot. Anything from sentry removal to guard-dog elimination, lights put out of commission, and CQB operations come to mind. Group fired offhand at 15 yards with FN 509 Tactical during initial range orientation. Considering that the FN 509 Tactical’s design intent borders on being an offensive handgun, especially when used with a red dot and suppressor mounted, I decided to dedicate some time evaluating the 509 Tactical working around breaching facades, door entries, and other CQB activities typified by experiences encountered in shoot-house environments. Echo Valley Training Center’s onsite Hesco Shoot House and Jungle Walk range were ideal test locations. A premium is placed on an accurate, quick-handling handgun such as the FN 509 Tactical, with multiple rounds fired in quick succession being the norm to put a target down. The natural pointability of the 509 Tactical comes into its own in this realm. Standard-pressure 147-grain 9mm loads are typically subsonic. This is one of the reasons 9mm handguns are favorite candidates to suppress, as functionality is not compromised with the use of subsonic ammunition. The YHM suppressor also proved effective at taming the muzzle blast of even 115- and 124-grain +P supersonic loads. With the Cobra suppressor installed, all loads could be fired without the use of ear protection. Variety of ammunition was employed during T&E, with a mix of manufacturers, bullet weights, and profiles. 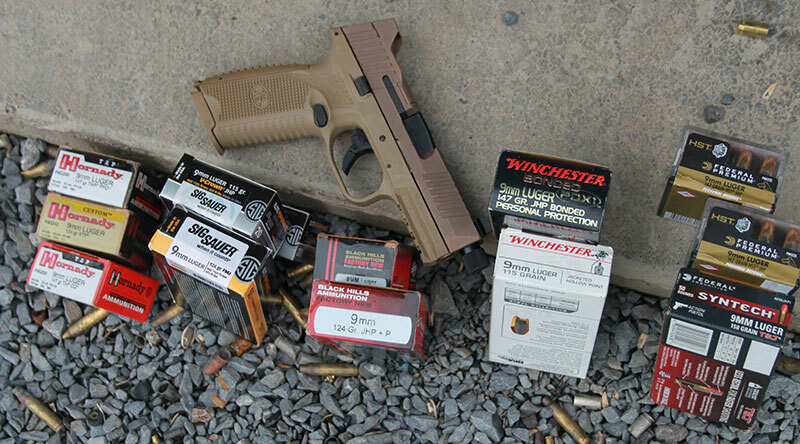 A variety of 147-grain 9mm loads were tested, including Winchester PDX, Hornady TAP, and Federal Hydra-Shok. Black Hills Ammunition and SIG Sauer 115- and 124-grain loads further proved the FN 509 Tactical’s ability to handle all loads. The FN 509 Tactical did not disappoint, producing two- to three-inch groups at 25 yards when fired from standing, unsupported positions. Bench testing could not be resisted after witnessing the unsupported accuracy results. Sub two-inch groups at 25 yards were not unusual and probably would have been smaller if not for my rudimentary bag support and gritty/heavy trigger. Training drills involving simulated cover such as EVTC range vehicle allowed FN 509 Tactical to be evaluated in dynamic settings with rapid strings of fire. The only negative encountered with the FN 509 Tactical was the trigger, which was especially noticeable during the accuracy portion of the T&E. The hinged nature of the FN trigger with factory pull weight makes the FN 509 Tactical a perfect candidate to receive an aftermarket upgrade in the trigger department. The added weight of the YHM Cobra suppressor did not prove a hindrance to weapon manipulation, and the extra capacity 24-round magazines are much appreciated, minimizing the likelihood of needing to change magazines during a typical engagement in which the FN 509 Tactical would be the primary weapon. The Trijicon RMR provided a consistent aiming point over the YHM suppressor. Further offensive role enhancement with the FN 509 Tactical could be achieved by mounting an infrared laser target designator such as the Insight Technology LAM 1000/ILWLP on its integral rail, combined with an operator using night-vision goggles. This obviously is a very specialized application for operations associated with elite LE or military units, but it’s great that it is available for the private citizen as well. 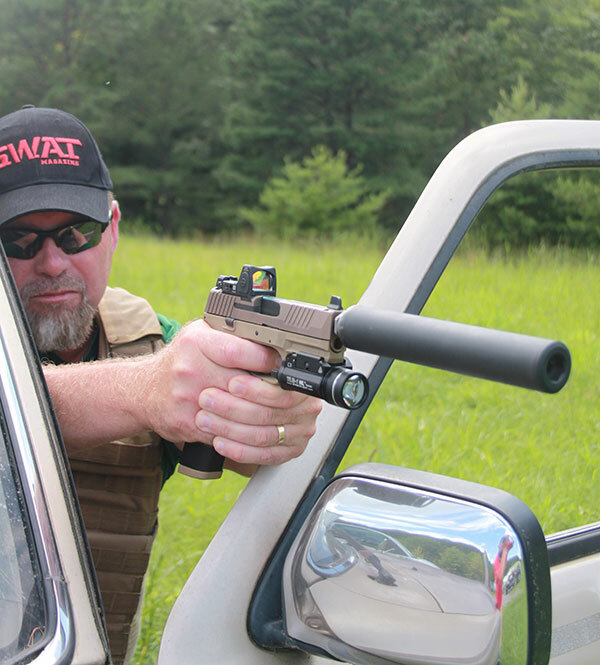 The FN 509 Tactical’s ergonomics and handling characteristics are quickly appreciated. The grip frame with enhanced texturing and the overall balance of the 509 Tactical made felt recoil negligible. The key point with the FN 509 Tactical is that it is eminently adaptable to individual, department, or unit needs. Everyone from a homeowner with a light/laser combo to an elite military team with night vision and infrared target designator and suppressor mounted will find the FN 509 Tactical a handgun worthy of consideration. The FN 509 Tactical arrives ready to go right out of the box. Kudos to FN for including the right features for maximizing performance. The buyer is getting a lot of value for the listed purchase price of $1,049.00. In any of its possible forms, the FN 509 Tactical is a potent package due to its accuracy, reliability, and capacity, which result in increased lethality.